As an eagle stirreth up her nest, fluttereth over her young, spreadeth abroad her wings, taketh them, and beareth them on her wings: So the Lord alone did lead him, and there was no strange god with him. I often wonder why authors have used metaphors to emphasize certain things in the Bible. The above verse is one of them. 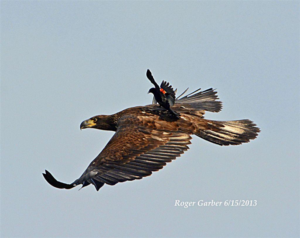 I know eagle is known as the “King of the skies” and symbolizes perspicacity, courage and strength but the protective motherly instinct of this avian was unheard of. This made me delve deeper and study about this bird. Eagles make their nest when nearing their breeding season. They usually choose cliffs or open areas in high mountains to make their nest which is called an “eyrie”. An eagle nest is constructed of interwoven sticks. The interior is lined with grass, corn stalks, and other material. The bowl filled with soft materials including moss and the downy feathers from adults which will serve as a fluffy cushion for the eaglet (the baby eagle) when it arrives. After the eaglet is born, the mother eagle feeds the little one and takes care of it very well. At around 10 to 12 weeks when the eagle senses that the eaglet is ready to fly, the mother eagle starts removing the comfy layer of her nest. Then the eaglet starts feeling a little irritated but still will not try to fly. Since the eagle is smarter it starts shaking her nest which forces the eaglet to fall out of the nest and because the eyrie is on a cliff, the eaglet will fall down. When the eaglet understands it is falling, it starts fluttering its wings and starts flying. So it takes its first flight or something called as “fledge”. Meanwhile, the mother eagle is not sitting still, it observes and when she feels that the eaglet is tired she flies down and spreadeth abroad her wings and takes them and beareth them over her wings. This is the way she trains her young to fly. So it was the same way the Lord protected the people of Israel. This comparison of an eagle taking care of her young is the best way in which the author of this book could metaphorize Gods love and care. The Lord is able to carry us through the storms of life. The Holy Spirit is able to lead us to eternity. He will guide us in all truth in this house of our pilgrimage. Sometimes as the eagle shaketh her nest to let the eaglet out of her nest, we will also have things which will shake us a bit. We might even start wondering whether The Lord really cares. In Jacobs life, while he was in Padanaram, he started thinking about going back to his land only when he found out that there was a change in the attitude of Laban towards him as we see in Genesis 31:2. There was a vow that Jacob made to the Lord which he forgot and the Lord had to change Laban’s attitude for Jacob to remember it. It was the only way that He could mould Jacob and make him Israel. Whatever comes in our life, it is taking us one step towards eternity. Psalm 91:11 says, For he shall give His angels charge over thee to keep in all thy ways. The Lord protects us from all dangers and harm and keeps us safe in its literal sense. It is not because we have something superior to anyone near us; it’s just because of His Grace. Never think when we are protected from something by which your fellow brother has perished, its only because you both had a different calling and God wanted separate things from you and it’s not because you were important and the other person wasn’t. God is never partial. He always cares. He will never leave us alone. My dear brothers and sisters just as an eagle teaches her young ones to fly ,the Lord Almighty also instructs us to fly when we are faced with problems. If we are on a precipice and we lose our grip and fall, do not worry, HE will take us and bear us on His wings. God will never let us fall. It is to make us stronger for his work and lead us to eternity without falling.